After seeing the Kitchen Nomad boxes on a few of the blogs I follow I knew I wanted to try one. A box of cooking bits from some unknown exotic place delivered to my door sounded like so much fun. I signed up for just one box as I wanted to see what it was like before I committed to a subscription. A box costs £25 and you receive a selection of ingredients and some recipe cards from a mystery country each month. You have to add a few things from your store cupboard and the fresh ingredients yourself. 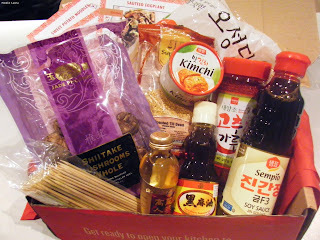 I was excited to receive this months box which had a Korean theme, I captured some of that excitement in an unboxing video. I already cook a fair bit of Asian inspired food and I did already have four of the ingredients in my store cupboard and I guess that is an issue with the theme of the box being a mystery. If you're not keen on the surprise element of the Kitchen Nomad boxes you can order past boxes and look up exactly what you'll be getting. Even though I already had a few of the ingredients, it was not knowing which country the box would be themed on that made waiting for this box so exciting. 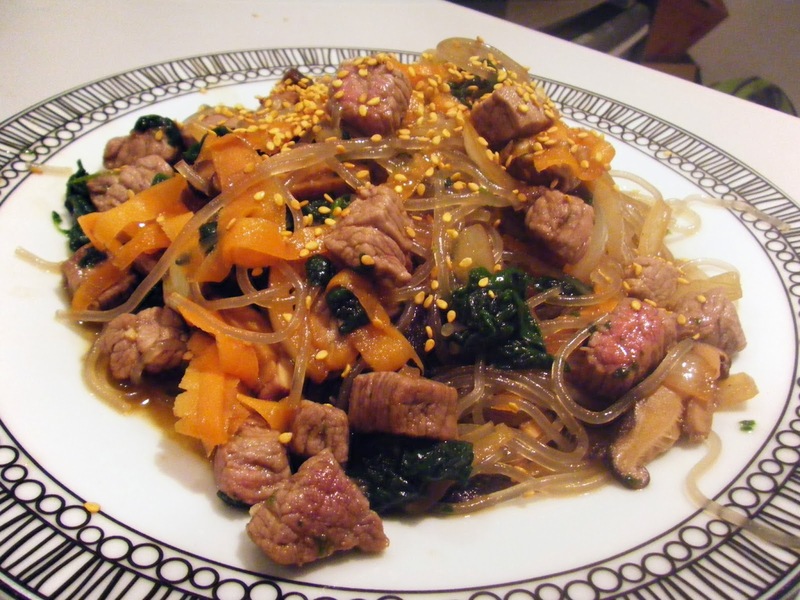 It also comes with a handy set of recipe cards and I made the sweet potato noodles with beef this weekend. I followed the all instructions but did feel they could perhaps be a little more detailed. For example you have to rehydrate the mushrooms by soaking them for several hours before cooking. I soaked ours in sherry but you can used hot water or even Soju (a Korean liquor) if you can get it but the recipe did not mention rehydrating the mushrooms before cooking them. It was a pain to have to convert from American cups to metric, as far as I'm aware the boxes only ship to the UK so I don't know why that measuring system is being used. I was worried I had made a mistake in my conversion as I found the noodles to be incredibly sweet. If you haven't made your noodles yet, I would suggest cutting down the sugar. Handily, the recipe cards also give an option for making the dish vegetarian. Despite being on the sweet side the final dish was full of flavour, it was the first time I've cooked the chewy glass noodles that are made from sweet potato starch and they were great. I'll definitely use them again. Finding new ingredients was exactly what I was hoping to get of this box so I'm a happy customer. I think there's great potential in these boxes, I'm always looking for new dishes to try and I'm sure that this monthly box will introduce me new flavours from around the world.